Whether it's a household setting or in a business, the selection and maintenance of an early warning system is critical to save lives and minimize property loss. Smoke alarms should be placed on each level of your home and outside of each sleeping area. If bedroom doors are closed, additional alarms should be located inside the bedrooms, as well. Since smoke rises, the installation should be on the ceiling at least four inches away from the nearest wall and away from drafts from windows or air ducts. As always, make sure to follow manufacturer's installation instructions and verify all codes and compliance with your local authority. That could include your building inspector, fire marshal or insurance bureau. There are two broad types of fire alarm systems; heat detectors and smoke alarms. Knowing the differences between the various types of fire alarms available is key to matching the appropriate product to the application. Heat detectors have a lower false alarm rate, but they are also slower than smoke detectors in detecting fires. Studies have shown that heat detectors are not as effective as smoke detectors in detecting fires in residential homes. Smoke alarms will detect most fires more rapidly than heat detectors. There are currently three types of smoke alarms on the market: ionization, photoelectric and combination ionization/photoelectric. An ionization smoke alarm contains a small amount of radioactive material. The radiation passes through an ionization chamber which is an air-filled space between two electrodes and permits a small, constant current between the electrodes. Any smoke that enters the chamber absorbs the alpha particles, which reduces the ionization and interrupts this current, setting off the alarm. This type of alarm responds best to fast raging fires. Photoelectric smoke alarms operate using a light source, a light beam collimating system and a photoelectric sensor. When smoke enters the optical chamber and crosses the path of the light beam, some light is scattered by the smoke particles, directing it at the sensor and thus activating the alarm. This type of alarm responds best to slow smoldering fires. Combination smoke alarms feature both ionization and photoelectric technologies. Ionization smoke alarms respond faster to high energy fires, whereas photoelectric detectors respond better to low energy smoldering fires. The NFPA recommends using both smoke alarms in the home for the best protection. Smoke alarms also vary in how they are powered. 9 volt battery powered smoke alarms are very popular due to their low cost, however, care must be taken to replace the battery on a regular basis. Smoke alarms are also available in 120 volt and a long life 10 year rated lithium battery. Many local or state building codes may require 120 volt interconnected smoke alarms with a battery back-up in case of power outages. The interconnected feature allows all smoke alarms to be linked together. This is especially important in multi-levels homes or in apartment buildings. Smoke alarms with high intensity strobe lights are also available for the hearing impaired. Regardless of the type of detector or alarm selected, the proper placement and maintenance of the device is crucial. Follow all manufacturers instructions for placement, testing and maintenance. The NFPA suggests battery replacement at least once a year on battery equipped units and a monthly detector test to verify the alarm function. Many users utilize daylight saving time in the spring and the fall as a reminder to change batteries. Q. How often should I change my smoke detector? A. 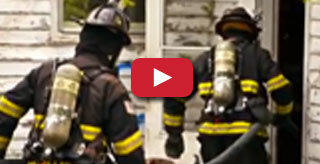 The NFPA suggests changing your smoke detectors every 10 years. Q. Are there options for the hearing impaired? A. Yes. There are smoke detectors that use visual and audible warnings. These use a bright flashing strobe light in conjunction with the horn to warn of danger. Q. Why is my smoke alarm chirping (or beeping)? A. This is usually an indication that the battery is dying and needs to be replaced. Q. Are there distance or square footage requirements for smoke detector installation? A. A general rule of thumb and most smoke detector manufacturers' instructions state, that smoke detectors should be installed every 30 feet in straight runs, such as a hallway or large rooms without obstructions in the ceiling. Most smoke detectors will cover approximately 900 square feet. Some states may have more stringent requirements for location and distances. It is best to check with the local municipality or fire department for code requirements and also the insurance carrier for the facility may have further requirements.